How often in history does it happen that one person can really make in difference? How often does an Oskar Schindler come along? or a Paul Revere? How often does it occur that one man caught in the middle between warring factions can find a way to save the precious lives of people on both sides? Such shrewd bravery--the kind that works covertly so as to be unnoticed and optimally effective--probably happens more often than we realize, though it's not very often that we find about it. But I did hear about one such person a few days ago on NPR. Robert Siegel was reporting on the activities of a young man named Mosab Hassan Yousef, who adroitly used an intimate family connection to Hamas (his father was a founder) to save people instead of blowing them up. And, as it turns out, young Mosab saved a lot of people...hundreds. "...because of his involvement he managed to prevent tens and tens and tens of suicide attacks against Israeli civilians.He managed to save the lives of hundreds of Israelis, Palestinians, and foreigners by giving the Shin Bet the right information concerning wanted terrorists, or concerning suicide attackers who were on their way...to commit their attack." As I heard this, I was wondering what would possess a person to do such a thing? Why would a person who has good family connections risk all that privilege and authority to take on a dangerous role as covert peacemaker? He would have to have heard from God or something. And that was news to the boy from Ramallah. He hadn't heard it before. But when he did hear it, he realized, after much study, that the key to overcoming all this earth-prone violence would be contained in that simple principle spoken by the Jewish Messiah. Imagine that. and slips unseen onto Olympic ice. and melts our hardened hearts with triumphant rain. Your tear dissolves our fear. Let's take a look at an example from ancient history. Abraham, the patriarch of Semitic cultures, had a nephew who had gotten himself into a bad situation. There was a war going on between tribal kings in the valley of Siddim, an area in Israel that is now covered by the Dead Sea. A powerful warlord named Chedorlaome had gathered some lesser kings; together they went on a conquering spree. After mounting an assault on the town of Sodom, Chedorlaome's forces pillaged their settlement and took some prisoners, one of whom was Lot, Abraham's nephew.. A fugitive from Lot's camp managed to escape, and reported to Abraham that his nephew had been taken away. The patriarch then assembled a band of his trained men, pursued the marauding armies, defeated them, and rescued Lot. Thus did Abraham's willingness to take corrective action fulfill the first condition of his subsequent role as patriarch of the Semitic peoples. After this assertive mission of deliverance, Abraham found himself surrounded by a group of thankful people (including his nephew Lot) and a collection of recovered goods. One beneficiary of Abraham's military prowess, the king of Sodom, offered all the booty to Abe as a reward. But the benevolent leader was satisfied with the mere rescue of his nephew and, presumably, the restoration of peace and justice. So he declined the grateful king's offer. Abraham's selfless distributions of windfall resources that might have been used toward his own enrichment were instead given to the recovering refugees. Among those gathered at the occasion of Abraham's victorious return from battle was Melchizedek, the king of Salem (now called Jerusalem), who was also a priest, or person having spiritual enablement. Melchizedek pronounced a blessing on Abraham, and Abraham, discerning the spiritual authority imparted in that blessing, bequeathed a tenth of the captured goods to Melchizedek for his priestly use. Abraham then went on to become, you know, a pretty important guy in the history of world events. Thus was leadership legitimatized in an ancient civilization in a two-pole balance of power between the king and the priest. Parallel to this in secularized 21st-century democracy is the sharing of governance that is initiated when our Chief Justice administers the oath of office to the President, whose agenda is determined by a third authoritative source, the people's Congress. Legitimacy requires, then: willingness to take corrective action, benevolence, and anointing. In our modern scheme of bestowing authority, the anointing ( legitimacy to govern), is now understood to originate among the people collectively, instead of some priest or pope. In the American manifestation of that principle, the President's anointing to lead is derived, according to the Constitution, from the consent of the governed instead of, say, coronation by a religious leader. In the confusion of 18-century emerging democratique republicanism , it's a lesson not fully comprehended by Napolean, who impulsively grabbed the crown of French emporership from pope Pius VII. Bonaparte's eagerness to embody the new zeitgeist propelled him into a presumptuous grabbing of power that ultimately led to his demise and the decline of French hegemony. 120 years later, Hitler made a similarly disastrous presumption, although his delusion about the source of legitimacy went much deeper than Napolean's. But that's a different historical lesson. Mr. America, tear down this wall. If the exuberance of this great nation is ever to win the rest of the world over to our ways of liberty, then let us live largely and not be paranoid about letting people come and go. Send us the huddled masses yearning to be free, and they will rejuvenate our culture of freedom in unanticipated ways that enrich and extend our cultural heritage. As oppressed people of the world gather to us, they stir up fresh winds of innovation; some of them will return to their countries of origin as ambassadors of our good will. Thus is our open American portal more persuasive than any other in the world. For a hundred years, the western nations were knocking on China's door, trying to persuade them to have an open door policy. Now it's time for us to reinforce the idea by keeping an open door of our own--an unhindered exchange of people and ideas, open source. Like Google. I got a little mad this morning when I opened some email from Pat Buchanan's crowd and started reading about the conservative agenda. I'm a conservative myself, but when he starts harping on illegal immigration, I had to write down a few rants of my own, 'cause that's the least of our worries. That labor dem crowd is right in there with him in the same paranaoid protectionist stripe. Americans just need to get off our asses and get back to work and quit complaining about all the other people in the world who want to be a part of our great experiment. My progenitors were largely Scot-Irish immigrants who arrived on these verdant shores in some past century seeking opportunities to start anew. I'm thankful they were not turned back at the harbor. Is our nation too crowded today to tolerate the open immigration of opportunity-seekers like those of ages past who propelled our industries to unprecedented levels of productivity? No. You want to know what crowded is? Look at Asia. Look at Mexico City and Johannesburg. Those places are bustin' at the seams. If we are going to coexist with the developing nations in the 21st-century, we need to share some of our frontier heritage so some of them can get a breath of fresh air and learn what freedom is all about. We are not crowded here in America. Yeah, sure we have problems. Doesn't everybody? Although our enlightened constitutional matrix constructed by ole white guys 250 years ago has served as an excellent framework for cultural freedoms to emerge, it is by no means the whole story. Our founding documents provided a superb beginning, but then we had to fight a bloody civil war 75 years later just to reconcile some of the structural deficiencies that the founders didn't have the time to properly resolve. Such is the history of human progress, especially in a democracy. We don't have time for perfection. You want perfection? You want something finely-tuned? Start a cottage industry and make watches or better mousetraps of widgets or software that surpasses anybody else's product. But in the public square, it's always been about what works for society as a whole. Make a deal and move on. Unfinished business will be forever with us, like the poor. Jesus pointed out that they would always be among us. He and his predecessor Moses spoke principles for taking care of them, and we need to employ some of those strategies, along with the prosperity-generating stewardship principles about which they also preached. Idealistic systems for engineering a classless society are pipe dreams. Get real. Marx and Mao, though they had a few accurate analyses, have been disproven as a source for societal construction. Find something good to do and get to work so you can contribute to the commonwealth instead of sponging from it. If you can't find it in yourself to do that, then get in line and we'll see what we can do for you. You lawmakers need to cut your losses and move on. Pass the dam health care bill and let's get everybody some access. It's time to move on. There's no such as thing as perfect legislation. The founding documents of our republic prove that. Give everybody a chance--that's what the "unalienable rights" from our Creator are all about. Multiculturalism is what made the USA the great nation that we are today. The vibrant diversity that propelled us into world leadership during the last century was not born of WASPish founding fathers spouting ideas of 18th-century enlightenment. Our greatest strength is, and has always been, our unique place in world history of hosting the genius of other cultures, and allowing them to bloom and bear seeds of innovation that are subsequently cast upon the jetstreams of the world. Give me the melting pot or give me death. The hardest-working people in the USA have always been the newest immigrants. This is as true today as it ever was; I've seen it with my own eyes. How many good ole boys in construction trades have been outdone in recent years by a crew of Mexicans? This is not a trend to be despised; this is the way it has always been. Maybe it is time for the good ole boys, having English proficiency, to get back in school and go on to greater horizons such as electrical work or HVAC. Read up on solar collectors, Marvin, and tinker with them a bit. You may be the one to make the breakthrough in efficiency that our post-industrial, post-commuter infrastructure is looking for. You might be the one to make that Edison or Bell or Ford leap forward into technospace while Juan and Edwardo are building the walls of the house where your new, improved designs will find their actualization. This essay is all over the map, I know, but then so are the peoples of the world, and we've all got something to offer. Thanks for tunin' in for a bit. Find something to do anyway. I was assisting a couple of HVAC professionals yesterday while they installed a new heat pump for an apartment where I do maintenance work. They were doing the important work, like using oxygen/acetylene gas to join copper tubes with silver solder so that refrigerant lines would be airtight and efficient. I had shoveled snow so that they could maneuver, with a little hand truck through a crusty foot of the white stuff, the compressor/condenser/coil exterior unit into its place behind the building. I was also taking care of minor chores like dropping an electrical cord out the second-floor window so they'd have 110 volts to power the vacuum pump that would remove all the air from their freon lines. Mostly though, I was asking a lot of questions. Roger explained to me very cogently how the old R-22 refrigerant, known generally as "freon," is being phased out, to be replaced eventually with a new gas, R410-A. This is because the new gas does not have chlorine. The old gas refrigerant, the R-22, released chlorine atoms into the atmosphere whenever it happened to escape a "closed" heating/air conditioning system. The chlorine ions would rise into the atmosphere and eventually bond with ozone, converting them into oxygen and depleting the protective ozone layer that once kept us from getting so sunburned. When I was a kid in the 50's, we had never even heard of sunscreen, much less used any of it, and we had a little sunburn now and then, but nothing like the sunburns you get today when you fail to slather the stuff on at the beach. So nature has played a little trick us this year. Is it a meteorological trend? Or an aberration? Only time, future winters and summers, and the statistics will tell us. what is happening. Perhaps nature or Nature's God (as Thomas Jefferson called him) is trying to tell us something: Just when you' think you've got it all figured out, expect the unexpected anyway. That way, you can prepare for any eventuality. We don't really know what the future holds. But I do know this. Sunburn is a lot more rampant in my children's generation than it was in the days of my childhood. So something is going on with that ozone layer. I'm glad we've figured out enough about the effects of chlorine gas in the atmosphere to make some changes. Aren't you? Another thing I've noticed recently is, (not to change the subject or anything): times are harder now than they were a few years ago. Who knows what will happen with the money situation? Not me. But consider this: if you haven't yet figured out what to do with your life, you should take a look around and find out what needs to be done to keep this old planet and all its people and machines and ecosystems humming. And if you see something that needs to be done, do it. And if you don't know how to do it, it's time you learned. Either way, get busy. Don't be waitin' for no bailout. Let me tell you about my Valentine. I found my Valentine thirty years ago. I'd just seen a face; I can't forget the time or place . There she was at the Asheville Junction, coffee house. Norman and Nancy Blake were playing that night. She married me shortly thereafter, and has taken good care of me ever since. I thank God every day for Pat. She has a smile that will light up a room. She has given birth to our three children, and helped me raise them to adulthood. She loves to care for people, including me, and shower them with love. She's at the top of proficiency in her chosen profession of nursing. She loves to take me away to faraway places. She loves for me to rub her back. She loves to talk, and I love the sound of her little New Jersey voice. Her faith in God and her faithfulness to me is an inspiration to everyone we know. She supports me in all that I do. She manages the money so I don't have to. She decorates our home and my life. She puts up with me, even my nose hairs. She saves people's lives in ICU, and she prays with their families and offers them continuous hope along with her professional excellence. She loves her eight siblings and their respective families. She loves to bring people together for festive occasions. She loves sleeping with me every night. We've made love in seven countries. She is feisty, but kind. I love her face. My greatest joy is seeing her happy. She's my God-ordained, special delivery valentine, and I love her. I understand this isn't on topic for blogging, but it's too late now 'cause you've already read it and I want all the world to know she's mine and I'm hers. Thank you. I was sitting on Frank's couch while he shuffled around his apartment looking for his Medicare card. Why was he looking for it? I'll get to that. In the midst of a very busy day and several inches of new snow atop a foot or so of old snow, I locked myself out of my maintenance office in a moment of confusion at the apartment complex where I try to keep everybody's stuff from breaking down and their feet from slipping on frozen white stuff, and so there I was suddenly unable to do much of anything productive, tools locked inside the shop with the keys, among other complications. So I decided to visit my friend Frank, the 94-year-old engineer, while I waited for my manager's return. You've never met anyone like Frank, and I hadn't either until a few months ago. His long life has been filled with a multitude of experiences and accomplishments, such as sailing a yacht around the Bahamas for twenty years or so, singing with a quartet in New York City back before the Great War, working as an electrical engineer for a long time with a manufacturing company or two in New Jersey, having a couple kids along the way with a wife whom I don't know much about except I know their union didn't work out so well. Being an engineer, Frank is a veritable fountain of knowledge and common sense for a fledgling maintenance man like myself. During this particular week (that just ended,) he had been consulting with me about the mechanics of salt-spreading, because I had been struggling to distribute various snow-melt substances on the sidewalks that adjoin the 94 apartments that I maintain. The cheapo plastic spreader that I had been using wasn't working out so well because the salt grains get stuck in the little door inside the machine that's designed (poorly designed) to let them tumble out so they can melt on the ground where they're supposed to prevent Frank and me and anybody else from slipping on the snow and ice. We had been having an ongoing discussion for several days about the mechanics of this task. Yesterday the dam thing had finally ceased working altogether when a plastic shaft broke in the middle. I had explained to Frank earlier that I had chosen the plastic salt-spreader thinking that it would not corrode and break down like the cheap metal one that I had used before purchasing the plastic one a few months ago. So there I was locked out in the middle of the day in a moment of exhaustion and exasperation and therefore decided to visit Frank; his place is next door to the office/shop. I walked in; he was cooking onions to go with something in his lunch and boy did it smell good, although I wasn't hungry because I had just grabbed a hamburger on the fly some thirty minutes before. I sat on the couch and had a few chocolates that he keeps in a jar on the end table. Old folks like to keep little sweet treats like that around, you know. He was looking for his Medicare card and I asked why. He explained to me, after inserting his hearing aid (which he had earlier removed because it doesn't work well for phone conversations such as the one he had had just a few minutes before,) that a woman at a medical office had requested, during that phone conversation, some bit of information that would be printed on his Medicare card. "It's not in here," said Frank, in his stunted 94-year-old voice, while flipping through the cards and plastics in his wallet. "I think I know where it is." He slowly righted himself from the easy chair with a maneuver that took some ten or fifteen seconds, then grabbed his cane. "...best thing an old guy like can do--use a cane. Dexter across the way won't use one, but it makes more sense to have three legs than two, I've found." "What information from the card are they requesting?" I asked. "The name of my doctor," said he. "Well, you can tell them that, can't you?" "Yeah, but she wants to verify that Dr. Birney's name is printed on my card. He's my primary care doctor, but I'm switching to another one, and we need to get all the paperwork straightened out." It took a long time, from my 58-year-old perspective, for Frank to vocalize all this. Meanwhile, at the nearby closet door, he's opening it and pulling documents from a stationery box with one hand while leaning on his cane with the other. "Dr. Birney's phasing out all his Medicare patients, or that's my understanding of it." "Really, and why is he doing that?" "I don't know." Frank turned his head slowly and peered at me through the bifocals with a goofy smile. "I guess he's had it with puttin' up with old guys like me." Frank is lol, and I was amused as well, at his cheerfulness in the middle of a locked-out, snowed-in day. 94 years and still laughing; it doesn't get much better than that. During extremely difficult circumstances such as these blizzards that now immobilize us, we should take a close look at our priorities. Determine what is truly important in this life, and act accordingly. I've decided that what really matters is more clearly seen if I ask myself this question: What can I do to help? What can I do? today, to help: ~those people whom I encounter today, ~those whom I love and who are dear to me, ~myself. 1.) I need to have a good attitude, one that will inspire others rather than discourage them. Only one person in the world can control my attitude, and I am he. 2.) Take my responsibilities seriously. There are millions of people out there who have made mistakes; I am one of them; these shortfalls collectively make the mess in which we now find ourselves. Furthermore, the immensity of this winter weather tribulation is evidence enough to convince me that now is not the time for assigning blame (we cannot blame anyone for a blizzard) ; rather, now is the time for assigning tasks, accepting them gratefully, and faithfully performing them. I am fortunate to have a job, and a few other familial/community responsibilities. What's important is that I do my job, and do it with a good attitude. What about you? Do you have a job? No? If not, ask yourself this question anyway: What can I do to help? When you hear an answer, then do it, whether or not it involves getting paid for it. Because we've got a lot of work to do digging out of this mess. And remember these ancient words of wisdom: "He has told you, O man, what is good, and what does the Lord require of you: but to do justice, to love mercy, and to walk humbly with your God." Someone at Hawaiian Airlines painted a woman's face on the tail of each aircraft. Whoever designed that logo had put some serious thought into the artwork, because it is a very evocative visual for an otherwise nondescript jetplane tail. As you view the lovely lady's profile between concourses while, say, sitting on another plane, her hint of a smile draws your imagination into a fascinating tale that she seems ready to tell. Maybe it's the story of Hawaii, a most amazing place. There's a flower in her hair. I think it's the hibiscus blossom you find everywhere in these islands, the large one that so many women love to tuck above one ear. But I'm wondering, as I consider this simple, almost cartoonish Polynesian silhouette, if the lovely lady may be on the verge of offering to us flown-in visitors some lilting island lullaby. Yes, I think she would sing for us if she could open that iconic mouth. It would be a soulful song, a wistful crooning, accompanied in the slack key, about a land called Hanalei. I was just there this morning, on Kauai; I woke up there, and I did not want to leave. She seems to be looking slightly upward. The artist has managed to depict in her expression, despite his art's sparse simplicity, a suggestion that the virtuous Mona Le'i is anticipating some gift from above. She's raising her eyes toward Mount Waia'le'a'le, I do believe. She's singing a melody that has been passed down from the Hawaiians of long ago; its a song, like the lei that accompanies it, of welcome. Though Jackie Paper has come and complicated her ancient ohana simplicity with highfalutin' Americanization, she nevertheless welcomes us fretful haolies in selfless innocence. Endowed by her creator with a perpetual halau smile, she greets the aging flower children as they make pilgrimage to the mystical north shore of Kauai; there they seek Paradise, like Ponce de Leon sought the fountain of youth; they come to frolic with their children in the mists of a land called Hanalei. And I think maybe they've found it--Paradise, that is. It's too bad that house prices are so high here--the price of living in Paradise. My friend Sunny and his wife and kid live here, though. He's writing software. But I can dream, can't I?. . . might have to settle for Honolulu, or even Florida. Oh, but it's time to buckle the seat belt and get back to the mainland. Aloha to the gracious wahine of the islands. 1.) Any expedition undertaken by a group through unfamiliar territory will generally be longer and more difficult than is indicated by any map or plan. 2.) Each member's expectations are unique. 3.) Each member's response to adverse conditions is unique. 4.) The group's goal or destination may be clearly stated, but each member's evaluation of achieving that goal is unique. 5.) One particular member, i.e. Jackie Paper, may exhibit zeal for the goal and abundant energy to achieve its accomplishment. 6.) Another member, i.e. Puff, may carry less motivation for reaching the group's goal or destination, and thereby allow him/herself to be delayed by adverse conditions. 7.) Jackie Paper's exuberant surge forward and Puff's dragging of feet will probably result in a distance between them. 8.) Other group members may be suspended between those two in indecision about achieving group goals or tending to individual needs. 9.) If cell phone service is not available, the dilemma presented to compassionate members by lesson #8 could reach critical proportions. 10.) The group's success in reaching the stated goal or destination may be in peril. 11.) Jackie Paper may surge ahead anyway. 12.) Puff may cease making any forward progress, possibly abandoning his/her contribution toward the group's destination altogether. Or, Puff may be persuaded to endure through the adverse conditions toward the mission's completion This lesson will require more time, and may call into question the group's allotted time frame, i.e. who wants to be slogging through steep, muddy trails in the dark while in a state of exhaustion? 13.) If the group goal or destination is achieved, the reward for that success may not actually satisfy the group's expectations. i.e. The panoramic view obtained by the group's overcoming adverse conditions may be totally occluded by the mists of the land called Hanalei, thus preventing any view whatsoever of the magical valley below. 14.) Have a little laugh and talk about it anyway. 15.) If all group members survive the expedition and get back to the hotel and live to tell about it, success is achieved and lessons are learned. 16.) Life is not about what happens to us; it's about how we respond to what happens. 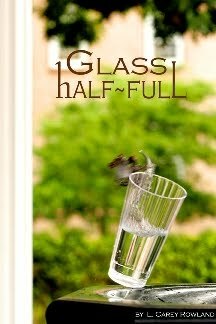 That's the Glass half-Full. 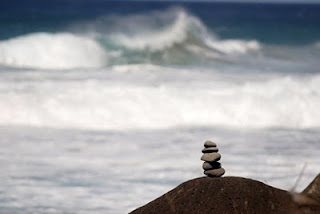 I was walking in the dusky part of a day along a beach strand of the north shore of Oahu, Hawaii. That's where surfers gather to ride the biggest waves in the world. I looked to the horizon, contemplating the sunset. Its radiant light beams pierced the fluffy clouds as bright spears. You've seen this scene, haven't you?, in your dreams, or perhaps in some photograph. The radiant beams are 93-million mile-long electromagnetic vectors sent to energize our planet. Though appearing now as straight lines, the sun's rays are known to be waves. They travel in infinitesimally small ups and downs with amplitudes of precious gifts for our planet--power to photosynthesize our air and warmth to make our fragile lives possible. I looked out at the wild ocean. Great swells of wave energy were rolling in through the waters, all the way from somewhere between Kamchatka and Alaska. The moon tugs mightily upon our planet, having its gravitous way with our wide waters while the land remains relatively steadfast. Unobstructed by any terra firma for thousands of miles, these immense north shore waves roll upon the Hawaiian island with immense poundings of physical force. Changing from deep, sapphire blue in the distance to sparkling emerald green as they mount their assault upon the shore, they are titans of planetary power that dissipate rather suddenly to nothingness between the course, brown sand grains of the beach. Where do they go? Gazing down at the wavelets that lap around my feet, I discover that those inbound giants, having such great magnitude just a moment ago, have translated into smaller and smaller ripples; they project their diminishing images as a multitude of shadowy intersecting interference patterns upon the sand. Late afternoon hues of azure and pink enfold the entire golden sand scene in bright sparkles. Waves, waves, it seems that all the universe is waves. All of nature is curvy and crashing and chaotic. Yet, as I survey once again the translucent aquamarine swells pounding this Pacific shore, suddenly the image of an emerald green crystal forms in my mind; it is absolutely straight and monolithic in linear perfection. So nature is not all curvy and crashing chaotic? Something is putting it together. How amazing is that? Oh God, here comes another huge one. Look! It represents the original declaration of one person to the universe: World, here I am. 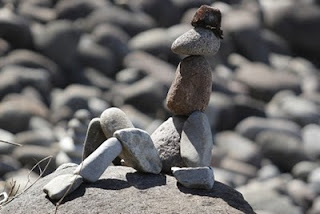 The stacking of stones is the most fundamental art of all; it establishes a record of one person's impact upon the world. It proclaims significance. It may be the original expression of collective worship. It even lays a foundation, perhaps, for more pragmatic ventures such as shelters and buildings. When undertaken in collaboration with others of the same tribe, the stacking of stones signifies the beginning of culture. I saw this piece yesterday during a hike through the Na Pali coast of Kauai, Hawaii. We encountered it where Hanakapiai stream meets the Pacific ocean. The photo was snapped at my request by my daughter, Kim.